Since someone found an old British wartime government poster in an old box in the attic somewhere the Keep Calm and Carry On fad has been everywhere. I must say I love the look of the poster (and all of it's parodies) and I think it's popularity in part is because the timing of this 'discovery' came at just the right time. Typography designs are hot in home decor right now and this one just has that sense of nostalgia and a nod to Britain at the same time. 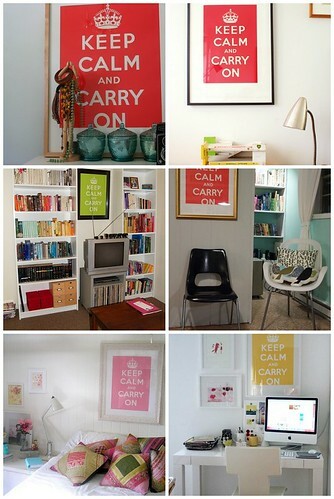 The great thing about the whole Keep Calm and Carry On designs is that it can work well in just about any room in the home from the home office/study to the bedroom or even the lounge room. The posters themselves come in a range of different colors (check them out here) which all seem to bring a different sense of style to them ...... and then there's the parodies. You can see some great looks that just use the posters in the image opposite, but there are other ways in which you can add a touch of this 'look' to a room. The use of throw pillows can be very good and there are a number of these available as well. I saw a display in a shop window a couple of weeks ago that used a poster of London on the wall with a leather armchair in front and slightly to the side of it with a Keep Calm cushion in it. The look was really cool and I visualized it being used with lots of bookshelves as well - your own private reading nook! Keeping with the idea of incorporating this design on the wall you can even get wall decals now which work really well for bedrooms. The Roommates wall decals that I've come across include the famous saying and crown along with a smaller crown, a Union Jack and a red telephone box - perfect for a London/England themed teenage bedroom. 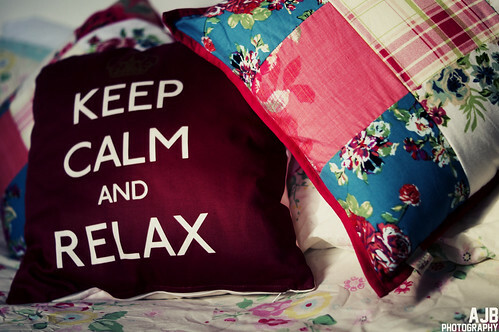 My middle niece has a turquoise Keep Calm canvas on her wall which she loves and when I came across comforter covers for beds as well I just knew that she would absolutely love to add that into her bedroom as well. These Keep Calm Comforter Covers are available in a number of different colors including this beautiful teal color which would work for a boy or girl's bedroom. The trick is not to go overboard so instead of having a canvas or poster on the wall with this bedding I would either not have anything or just stick to a wall decal. You can get the canvas in a small size to prop up on a shelf or desk if you want to which will stop it being too over the top. These are also available in a range of different colors (and even patterned backgrounds) to suit your decor.